Autobiographies of a bartender-turned-metalsmith, a “burned-out” TV production major, and a UC Berkeley economics graduate cluttered the walls of City College’s City Arts Gallery–were the alumnus’ shared theme was a discovery of their talents as metal artists and an ability to succeed in its “niche” markets. There was a feeling of self-discovery in the gallery. Accompanying the autobiographies were metal arts pieces that were from minimalist nylon-coated steel necklaces by New York City-based Meghan P. Riley resembling colorful dreamcatchers turned runway-ready earrings to Berkeley-based Alison Antelman’s labor-exhaustive $9,600 22k gold necklace with tiny meticulously hammered bullet-like links. “Metal has intrinsic value that gives it an edge on other products,” said Gabriel Sider, whose metal casts were shown. Their work, unlike canvas paintings or photographs, is made from expensive material, and is found in higher-tier markets, among self-purchasing generation-Y women, but is not quite among the ranks of Cartier or Tiffany. The exhibit made an effort to convey the spectrum of labor and technique applied to this “niche” market of metal arts jewelers, and also inserted metalsmiths outside jewelry. Her insistence led her to an intern scouting at Oregon College of Art and Craft, where she presented her portfolio, which included “Gnaw,” a series of metal sculptures in which she employed chasing in reposé, which involves hammering at a thin piece of copper to emboss and create depth. The series is coated in enamel and looks like wooden protrusions hung from walls, with the faces of small mammals gnawing out of the center of the pieces. The shimmer provides a dreamlike effect. Riley’s collection, Axis Mundi, converged metalsmithing with New York fashion. Earrings looked like the chaotic insides to a desktop computer of colorful wires turned elegant with quartz stones. “Coming up with a new body of work every six months is difficult. If you watch Project Runway, you know they have to keep the ball rolling,” said Suzanne Pugh a curator and metal arts instructor at City College. “Making It” showed works by City College alumni who are active and working artists, many of whom are also involved in teaching workshops and founding metal arts organizations, using techniques dating back to a pre-industrialized era. Metalsmiths know their work relies on no luck or accidental happening. “The tools and techniques are ancient–looks just like it was 5,000 years ago,” said Pugh. 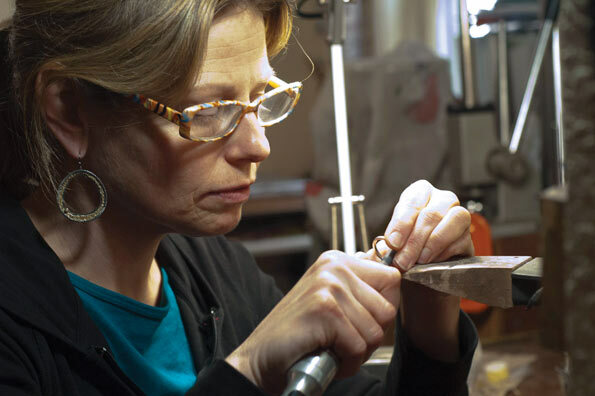 Some artists, however, are modernizing the craft by incorporating technical materials, like Jenny Reeve’s argentium sterling silver, which allows for easier bonding of the metals and has been publicly available since 2003. 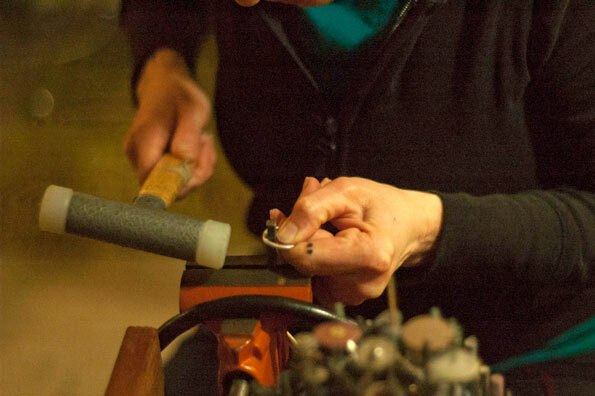 Her first metal ring stunned City College’s then-metal arts instructor, Steven Smith. Working one of her then two bartending jobs, one of her customers noticed her first steel ring, adorned in two blue stones, that she made in her first seven weeks of class. “I saw what two people near me were working on, and my brain superimposed them together,” said Reeves of her first ring that wildly excited Bairds and landed her collection at Adornabella in the North Beach district. Gabriel Sider, the sole male artist in the show, also showed the only casting–melting metals into solid pieces from molds. “Chess,” is an explosion of chess pieces resembling a tree. With computer-aided design, he is able to make a 3-D model to make into molds that then cast metals, rather than meticulously carving a design out of wax. “Metal, for me, is like alchemy. You can work 3-dimensionally really easy. Right now it’s terribly exciting because of CAD work. It’s one of the most exciting times for anyone involved in casting jewelry or products,” he said. The closeness and accessibility to the artists’ stories and methods evoked interest from students who attended the exhibit. In my time at the exhibit, a girl had quietly wandered in and left with encouragement from the gallery sitter to join the program.